A list of 125 catchy graphic design taglines that display the creative edge of business. These slogans focus on a business marketing their ability to provide affordable and unique solutions to a client. A brand new way of marketing. A passion and eye for design. Believe in the power of ideas. Blurring the line between art and technology. Creative solutions, handled with care. Custom graphic design done efficiently. Custom graphics delivered on time and on budget. Design & marketing for maximum impact. Design that leaves a lasting impression. Design that puts the fun in functional. Design with style. That’s all you wish for. Designs that make a statement. Dress your company for business. For creativity get to know us. Good design for good reason. Good design makes the world more awesome. Graphic design served up full service or a la carte. Helping you define your brand. High quality, affordable graphic design. I’m passionate. I’m creative. I love what I do. Making ideas come to life. Making you look good in person and in pixel. Plant your ideas, grow your brand. Providing big agency results with small agency pricing. Short for brand. Good for business. Smart branding starts with white space. The graphic design studio you can trust. The next great story is yours. Think of us as pixel stylist. We can make your business shine! We like to make things look pretty. We share your dreams with the world! Where imagination and art meet. Where innovation, imagination and ingenuity meet. Where ordinary is never good enough. While others talk we listen. Working harder for your business. 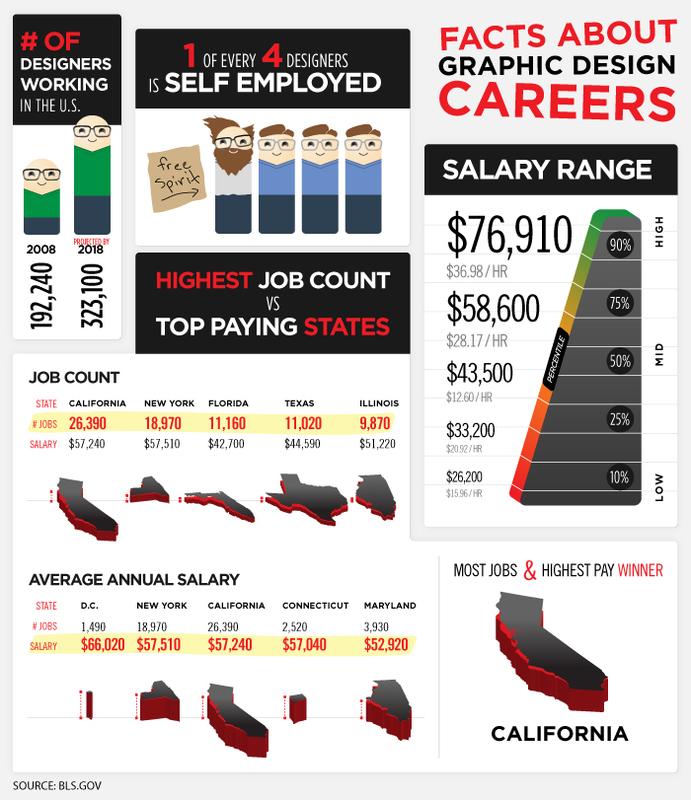 The following infographic outlines recent career statistics for the graphic design industry. One out of every four graphic designs remain self employed.